The Elections for the university university council are about to start again. Fractie SAM is exited to share its list with you; our candidates are exited to run for a seat to make sure that TiU will improve in the upcoming year even more. On the photo above, you can find our first nine candidates. From left to right: Anne-Mae Meulensteen, Anne-Lin Heyne, Gijs Reukers, Janneke Hoenders, Mart Senden, Jody Esveldt, Robin van der Beek, Kalliopi Argyraki & Sterre van den Berg. They are all extremely exited to improve our university with new and fresh ideas! Here you can read about them and their ambitions. The picture below, is our full list for the election on April 23rd, 24th & 25th. 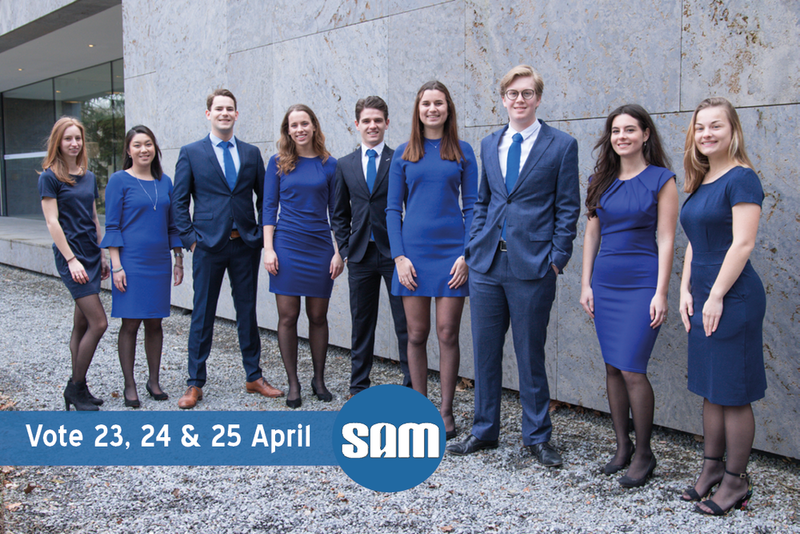 Fractie SAM is the oldest student party of Tilburg university. Our desire is to improve the studyclimate at Tilburg university to a point where all students can fulfill their ambitions. To get to this point, we focus on four pillars: quality of education, students facilities, access to the labor market and opportunity for extracurricular development. We believe Tilburg University students are ambitious during their student life. Whether it is inside and/or outside the curriculum, students want to fulfill their ambitions and maximize their student time. We will ensure that all Tilburg University students will get the opportunity to fulfill those ambitions. Our four pillars are Four Pillars: Quality of Education, Student Facilities, Access to the Labor Market and Extracurricular Activities. The Four Pillars can also be found below. Fractie SAM provides the university with ideas of new student facilities. We believe that facilities, such as workspace, sport facilities and facilities for student well-being are backbone for enabling students to fulfill their ambitions. As fractie SAM we not only stand for improving only your bachelor or master program, but also want to provide you opportunities for development outside of the usual lecture halls. Currently, it is a great advance to have obtained knowledge about certain soft-skills.